Philippine Dota 2 teams, the road to The Asia begins here! Fight for the 10000 PHP prize pool and a slot for the Asian Cyber Games National Finals for the Philippines. 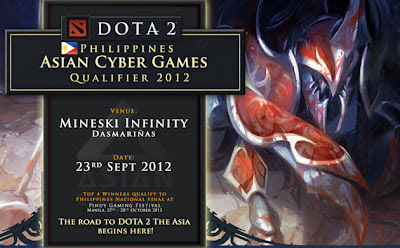 The top 4 teams for this tournament will be given a slot for the upcoming Pinoy Gaming Festival (ACG Dota 2 National Final - Philippines) this October 2012. The winner of the National Finals will be given a chance to compete with the top Asian teams (including The International 2 Dota 2 champions - Invictus Gaming) in Kunshan, China later this year.